Sometimes, a patient may put you in a circumstance that forces you to get creative about your wound management. 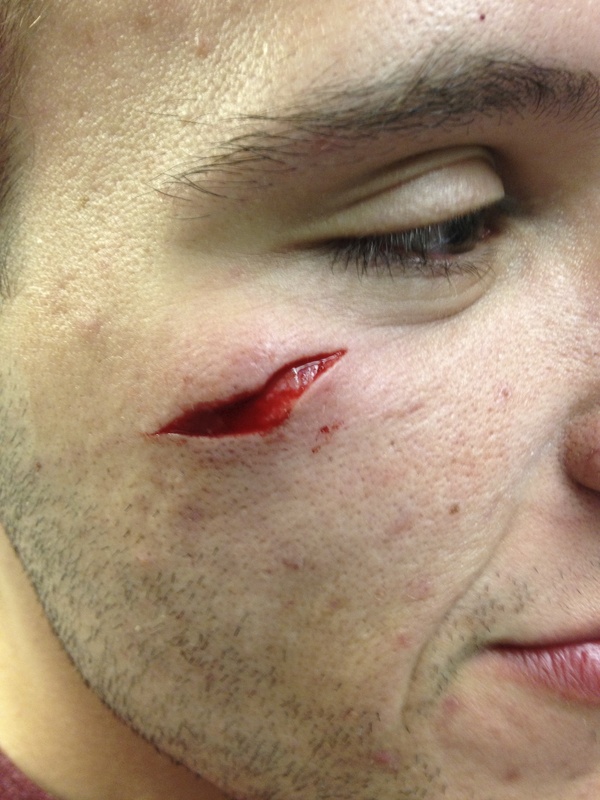 Young man with a facial laceration. 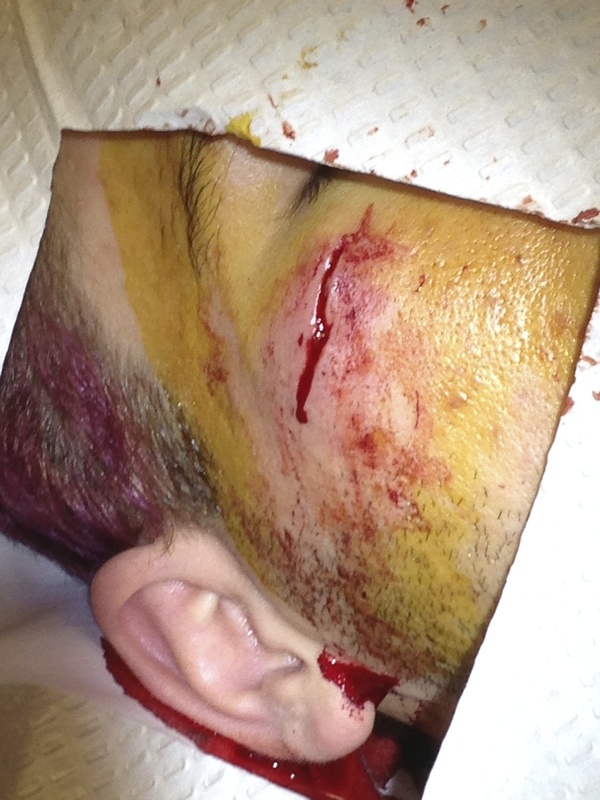 This and all subsequent images used with patient permission. Take this case for example. I met this young man as a patient in the ER earlier this year. He got out of bed during the night, tripped in the dark, and hit his face on the bed post. He sustained a pretty substantial laceration. Being that it was on his face, I wanted it to look nice. And given the tension on the wound edges and irregular margins, I felt he’d do a lot better getting a closure with simple interrupted sutures to give the wound better support. But he made it very clear to me from the outset–he was uninsured, and not planning to come back for any additional visits, as he just couldn’t afford it. What were my options? I considered trying to patch something together with dermabond and steri-strips, but I felt that given the nature of this wound, he would do a lot better cosmetically with sutures. 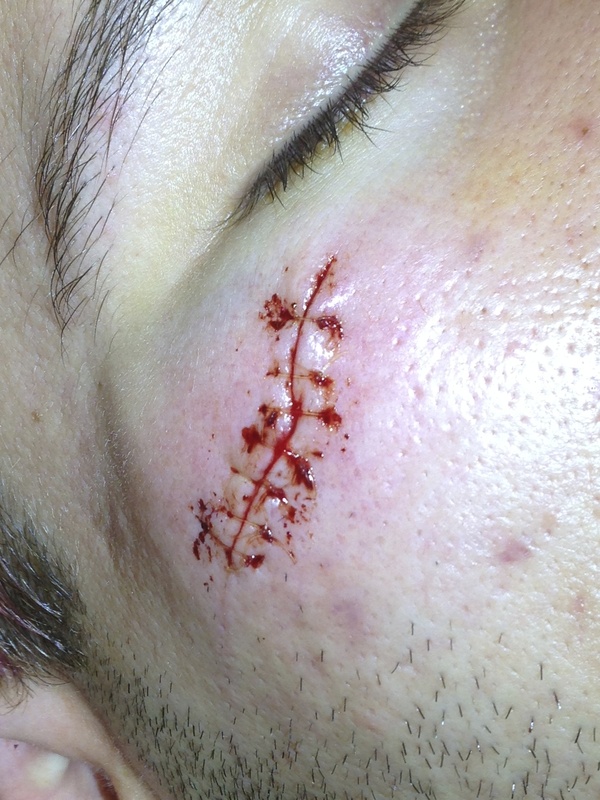 I wondered: does current evidence support superficial closure of the skin with absorbable sutures in traumatic lacerations? Traditionally, we think of absorbable sutures for use in the dermal layer, where they can’t be accessed again–in this case, absorbable suture placement is the logical option. They maintain tensile strength initially, and are hydrolyzed over time as the scar tissue matures. But use of absorbable sutures for closure of the superficial skin layer has been gaining wider acceptance over the past decade. Especially in the pediatric population, where the fear of suture removal is just as traumatic as the idea of having sutures placed in the first place, this is a useful technique to consider. An RCT published in Academic EM in 2004 compared cosmetic outcomes of pediatric lacs repaired with absorbable plain gut vs nonabsorbable nylon sutures. They found the use of absorbable catgut sutures to be an acceptable alternative to nonabsorbable sutures, with similar cosmetic outcomes and similarly low rates of dehiscence and wound infection. The findings of this study were reproduced in a 2008 study looking specifically at closure of pediatric facial lacerations. The data supporting this technique is more limited in adults, but the results are similar. But seeing as how the pediatric studies included pediatric patients up to 17 years old, I think it is a safe assumption that this technique can be generalized for use in adult skin. The key thing to remember when using absorbable sutures for superficial closure (when you don’t plan to have the patient return for removal or wound check) are the degradation properties among the different types of absorbable sutures. This helps determine their optimal uses. I’ve created this “cheat sheet” which I think sums up the best uses of absorbable sutures for different areas of the body, matching the effective wound support they provide with the period of time that we typically recommend leaving non-absorbable sutures in place. Mind you–“effective” wound support refers to the amount of time the a tied loop of suture maintains tensile strength, not the time it actually takes for the suture to dissolve–more on that in a bit. In the first study I mentioned above, the authors used exclusively plain gut sutures based on their wide availability. 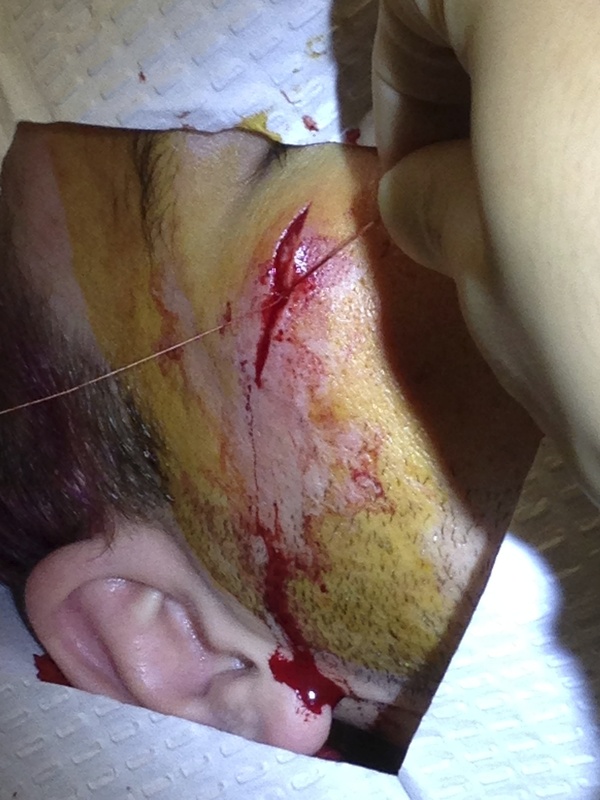 But the reality is that these sutures don’t actually absorb for about 30 days. They provide effective wound support for about 8-9 days before the suture is likely to break. Given the characteristics of these sutures, they might then be best for use on chest or extremity wounds. There are other options out there as well if you don’t want the sutures in the wound quite as long. Fast Absorbing Plain Gut (FAPG) sutures have been heat-treated to aid in dissolving. They provide effective wound support for 5-7 days, but still don’t completely absorb for 14-28 days. Given the duration of effective wound support, this would be the more ideal suture for closing wounds on the face, and this is in fact what I used on the patient I described. Chromic gut sutures (gut treated with chromium to decrease tissue reactivity and slow absorption) will provide effective wound support for 10-21 days, but don’t truly dissolve for 90 days, so probably not the suture of choice in this situation. They may (rarely) have applications for wounds closed on the back or other high tension areas. Polyglactin (vicryl) sutures might seem like a favorable option–being a synthetic suture, it is less tissue reactive than a gut suture. But it’s degradation is similar to chromic gut: it will provide effective wound support for 21 days, but it doesn’t dissolve for 90 days, so again it will end up sitting in the wound longer and increases reactivity and infection risk if not taken out. There is a type of Vicryl known as “Vicryl Rapide,” which has been gamma irradiated to speed its absorption, providing effective wound support for 10 days and complete absorption in 42 days. This could potentially be a useful suture in this situation, as long as the patient knows to pick out the pieces of suture after about 10 days to minimize infection/reaction risk. 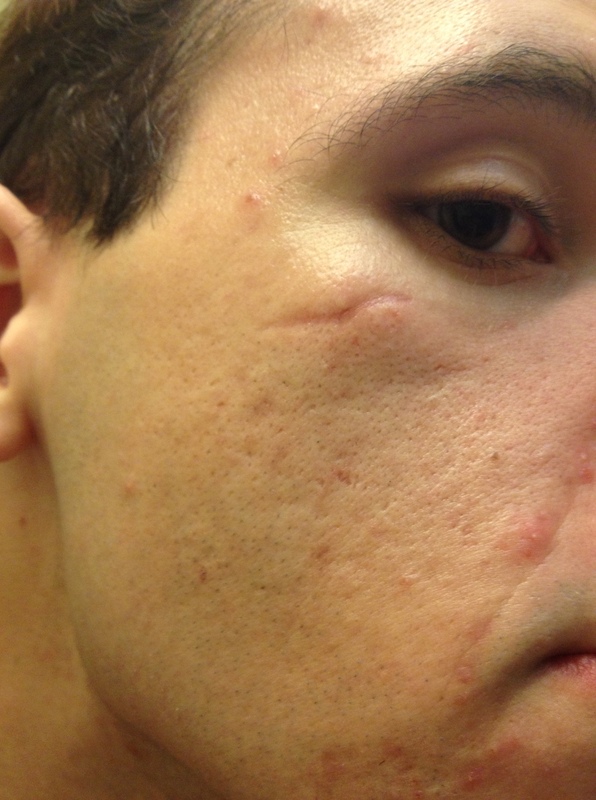 First, several 5-0 vicryl deep dermal sutures were placed to remove some of the tension on the wound. The appearance of the wound after closure with simple interrupted fast absorbing plain gut sutures. The one comment I would make is that sewing on the face with FAPG is like sewing fine threads of tissue paper through skin. Pulling on these sutures too hard is likely to make them break apart. So you will want to reserve this technique for relatively low tension wounds, or use a layered closure or undermining to reduce superficial tension. 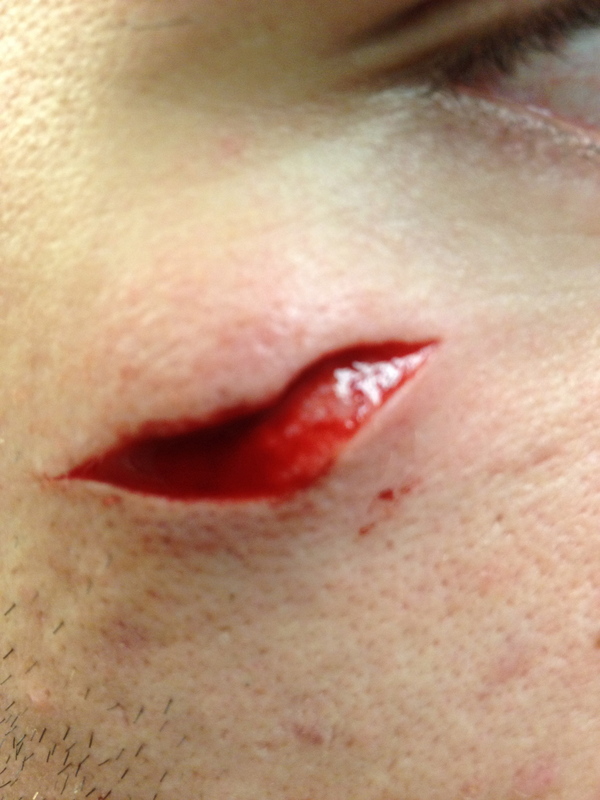 The appearance of the laceration at 3 months post injury. This brings me to an interesting study published in 2013 which revisited the topic of absorbable vs non-absorbable sutures in pediatric facial lacerations. In this study, the authors found* that when blinded health care providers rated wound outcome photographs from patients with fast absorbing gut vs nylon sutures at 3 months, these providers actually felt nylon sutures did provide a better cosmetic outcome–contrary to previous results. However, when parents and caregivers of the children whose wounds were repaired were asked to rate the scar outcomes, they found no significant difference in the perceived outcomes. Further, all the parents in the absorbable suture group said they would want wounds repaired the same way in the future, while only about three quarters said the same in the nylon suture group. Bottom line, this is a method that parents, caregivers and patients like; but beware that for the very best cosmetic outcome from a provider perspective, absorbable sutures may not always be the way to go. *A bit of a tangent for this discussion, but another endpoint these authors actually monitored was how many days it took for all of the absorbable sutures to completely dissolve. They found that fast absorbing gut sutures lingered in those wounds for up to 2 weeks. An important point is that the hydrolysis rates for suture materials I mentioned before relates to their absorption in a moist environment, so the buried portion is likely to dissolve, but the exposed skin portion may remain. The longer they sit in the wound, the more they will contribute to wound inflammation, stitch abscess formation, and poorer cosmetic outcomes. So rather than giving the patient the false expectation that their sutures will dissolve in to thin air, better to let them know that at the designated time they should expect the tie to come loose, at which time they should use tweezers to pick the remaining threads of suture from the wound. It’s possible this may have made a difference in the cosmetic outcome ratings in this study.